It’s official: the northern end of Todd Mall is definitely intended to be opened to traffic – two-way – down to The Sails and left into the eastern end of Parsons Street opening onto Leichardt Terrace. The road will be narrow, the speed 30kmph, and the footpaths wide; at Parsons Street on the southern side, as wide as 7.5m. This will create space for pedestrians, for future al fresco seating in front of commercial premises, and also for a “bio-diversity corridor”. 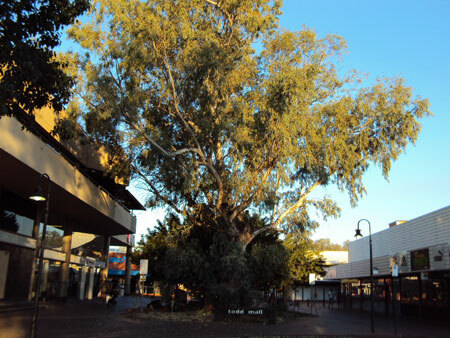 The idea is to make a connection between the majestic red river gum, known as the Grandfather Tree or Knowledge Tree, that stands just west of The Sails, and the Todd River. The bio-diversity will come from a water feature – a slender stream, fed by periodic flood irrigation, running the length of the street, and plantings, including “dancing trees”, coolabahs with their writhing limbs, planted in human-like clusters. These in turn will attract wildlife, such birds and butterflies. At a public meeting about the proposals architect Susan Dugdale showed images of the kind of stream envisaged – sunken, edged with shrubbery and, at a higher level, paving. Her inspiration is such a use of water in the streetscape of Isfahan in Iran. The corridor would also be shaded by wing-like structures, taking their cue from the spread wings of the hawkmoth, made famous in a photograph by Mike Gillam. There’s no doubting the eternal significance of the hawkmoth, metamorphosis of the yeperenye caterpillar, sacred to the Arrernte. It’s interesting, however, that the creative brief for the corridor project by Gillam and Arrernte custodian Doris Stuart, in its original form proposed other visual cues – urban birds such as magpie larks and corellas, the native passionfruit flower, the caper white butterfly chrysalis, the glowing red fruits of the plum bush, and the dancing forms of trees. Perhaps some of these riches will emerge in the public art for the area yet to be commissioned. It is possible that some of the art may be incorporated into or supported by the shade structures. The Todd Mall North and Parsons Street projects are two of six proposed by the consultant team led by Steve Thorne of Design Urban Pty Ltd in Melbourne, with Ms Dugdale a member of the team. The Town Council have been asked by the NT Government to project manage and it is they who have selected the first projects, seen to be feasible in relation to the funding the government has made available – $5m. The selected projects will be subject to a further public consultation phase, in a timeframe to be announced. The plans will be put on display in the library, in council’s foyer and on the display screen in front of Adelaide House. The Todd Street North project has the sub-title “Open for Business”. Deputy Mayor Liz Martin, chairing the meeting, said that bringing traffic back into that end of the mall had been “driven by retailers”. This was challenged from the floor by women from the travel business on the corner of the mall and Parsons Street: “No-one has spoken to us.” Ald Martin responded that the push by some retailers to re-open that end of the mall pre-dated the recent consultation process; Mr Thorne said there were representatives of the “commercial sector” on the project’s steering committee (they are Julie Ross, Brendan Meney and David Forrest). Mr Thorne said revitalisation is complicated and will happen over time. Allowing traffic and some parking will bring people into the area in an “aspirational way” and, it is hoped, will induce the businesses in Alice Plaza to “turn around” and face the street. He had earlier described that section of the mall as “one of the poorest public spaces you’ve got”. These women were also concerned by the disruption to their business that prolonged works might cause. They were assured that such an impact would be taken into account by the project managers, who would work on one section of the project at a time. Various misgivings about bringing cars back into the northern mall were expressed from the floor. Pip McManus wondered what “vitality” they would bring. She said the main difference between the northern and southern ends of the malls seemed to be the outdoor cafes at the southern end. A more fruitful move at the northern end could be the reorientation of the food court in the Alice Plaza, offering outdoor eating options. She pointed by way of example to the attractive indoor / outdoor food court at the Fremantle Markets. Ms Dugdale responded that it was hard to know how to engage private commercial interests in this process but said that perhaps this was a conversation that council could have with the owners of Alice Plaza. One man said he valued the mall for the experience of walking through it without noise or pollution from cars; he said there was “nothing artistic about traffic” and he could not see the advantage to motorists, pedestrians or shops, given that there are plenty of carparks in the vicinity. Another man said getting people into the mall would be best done by having them live there, in apartments above street-level businesses. Peter Turner wanted to know if one-way traffic would not be a better option. Ms Dugdale said that nothing slows cars down more than another car coming in the opposite direction; traffic experts know that the safest traffic is two-way in a narrow street. Mr Turner also wanted to know where the kwatja (water) for the stream would come from – “we’re in a desert” – and was concerned about it being clean as his “countrymen will drink it”. Ms Dugdale explained that the stream would be flood irrigated intermittently. Mr Gillam said storm-water would be captured, cleaned and stored before being fed into the stream and re-circulated. The water would be moving and so would not encourage mosquito breeding. He described Parsons Street as a “buried gem” that could be rescued from “generations of clutter” to allow views straight through to a range some nine kilometres distant in the west and to the river. He pointed out the advantage of winter sun warming the southern side of the street, which may become a cafe precinct in the future. It will be important to limit heights of buildings on the northern side, to preserve this exposure to winter sun. From the floor it was suggested that Rundle Mall in Adelaide works well. Mr Thorne pointed out that it is supported by a population of one million. He said Melbourne’s Burke Street mall had experienced problems (with a population of five million) and one of the solutions had been to shorten it. Lisa Stefanoff from the floor suggested that the kind of traffic allowed into the area could be moderated by having a taxi rank there and parking for cars with disability rights. This suggestion was warmly welcomed by Mr Thorne and Ms Dugdale, who also suggested a drop-off, pick-up zone. 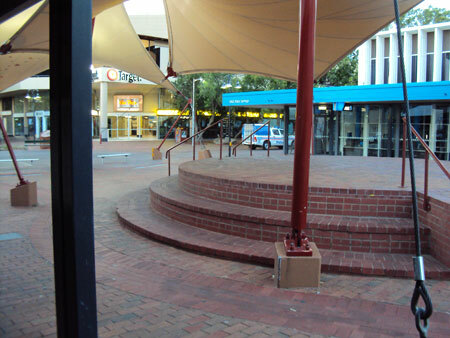 A place for children to play was another suggestion from the floor, by Jo-anne Harkin, who pointed to the play area with water fountains that children can run through in Darwin’s Smith Street mall. Ms Dugdale said a multi-purpose play area was envisaged in front of the Knowledge Tree. She had earlier spoken of de-cluttering the area – removing the excess of bins, posts, seating and so on. The exotic vegetation in front of the tree will also be cleared. There will be a commission to design the play area, with sculptural forms that could serve as seating, climbing and skating surfaces. There is also potential for another play area at the end of Parsons Street, on the river bank, but that is outside the scope of the current project. Jenny Mason, who organises the fortnightly Todd Mall market, wanted to know how the introduction of traffic would impact on the markets. The area would be blocked to traffic on market days, said Mr Thorne. 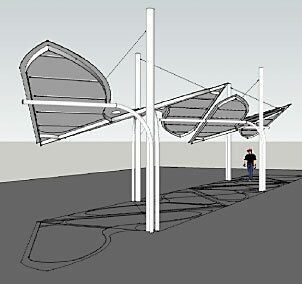 The Sails in their current form will go, while being conceptually echoed in the shade structures along Parsons Street. The rotunda will also go, although the “founder bricks”, bearing people’s names, will be re-used in the streetscape. David Havercroft from the floor wanted to know what areas would be available for public performance. Mr Thorne said a future project, conceptualised at this stage but un-funded, will create a kind of amphitheatre in front of the Flynn Church that could serve as a performance area as well as an informal gathering area. He said the design team had wanted spaces and structures to be used for more than one purpose as much as possible. An example of this would be the moth shade structures. Ms Dugdale said they should incorporate power-points for market stall holders, rubbish bins, artwork and act as lighting supports. Geoff Booth, Town and Country pub-owner and organiser of Action for Alice, had asked about lighting and wanted to know whether tree planting would impact on CCTV cameras. Ms Dugdale didn’t know; Mr Thorne said there would be no new plantings in the length of the mall other than at the southern and northern ends. The consultants have taken a “light touch” approach, said Mr Thorne. Their interest has been in “capacity building”, developing “new relationships between people and place” and “reconciling different traditions”. Earlier plans for repaving the mall have been put on hold, as the present funding of $5m would not be enough to even deal with the services underneath; it is not known exactly where or what they are. The team was also wary of the potential economic disruption that such extensive works would cause, when the priority is to arrest and turn around the current poor economic and social performance of the area. The Built Form Guidelines developed by Mr Thorne and Rob Adams are being reviewed following public comment and will be re-issued for further public comment. The consultants’ work has now finished, although Ms Dugdale will continue in order to document the projects to be pursued. The detail of the team’s brief and process as well as the many stories, images and ideas they have gleaned along the way has now been made accessible via a website, called connecting@lice. Pictured: from top – View east from the Knowledge Tree through The Sails to the river: de-cluttering will be a first step to improving this area. • The Knowledge Tree from Parsons Street west: the works will restore it to pride of place.• The present, not pretty picture looking north-east to the junction of Parsons Street and Todd Mall. 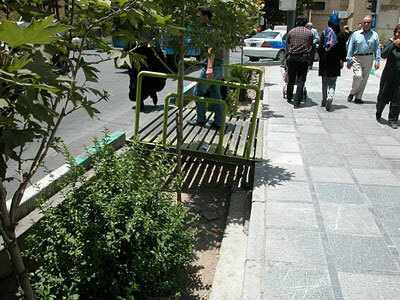 • A sunken planter bed with footbridge in the Iranian city of Isfahan, inspiration for the new streetscape in Parsons Street. • Architect’s drawing of the moth-inspired shade structures, Susan Dugdale & Associates. 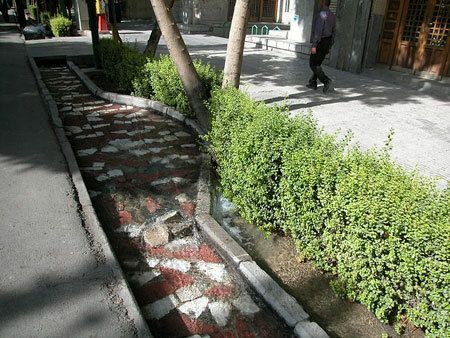 • Stream in Isfahan: by flood irrigating the sunken planter bed, a slender stream will periodically flow through Parsons Street. • • Yeperenye hawkmoths, detail of photograph by Mike Gillam: the moth wings have inspired the design of new shade structures. With respect to your poll, I believe you have asked the wrong question. The issue isn’t just about cars, but how to induce a more vibrant, safe and active northern part of the Todd Mall between Parsons Street and Wills Terrace. The proposal to open the mall to cars (it is half open already) can only work if shops open out onto the street. This point we have stressed throughout the consultation process. Providing a small amount of parking is an inducement to capture passing trade and persuade shopkeepers and landlords to open towards the street. Currently most shops turn away from the street. This is not a desirable situation, hence the strategy to make some changes to make this a more vibrant and safe part of town. He mentions that the Todd Mall is a shared zone, a point I hope Council will instruct its Rangers to take to heart when they next threaten to issue a fine for riding a bike in the mall. He also mentions proposing a widened shared zone on Parsons Street that will link to cycle paths along the Todd River. But any east / west connection between the existing shared pedestrian / bicycle paths on the Sturt Highway and the Todd River will need the Alice Springs Town Council to come on board. I would like to place on the public record that as a member of the Steering Committee I have not supported the opening up of the northern end of the Todd Mall to two way traffic. There is some merit in opening up the top end of the mall to restricted traffic such as disabled parking, taxis, emergency vehicles and short term drop off points but the whole question of traffic revolves around how the businesses and the public see the future vision. Imagine if the Plaza was partially opened to the mall and the food court “spilled” out onto the street and shopfronts were “alive” again, and the dynamics of the Todd Mall North would be changed forever, then we may be asking the question did we need to bring the cars back as a way of stimulating activity? 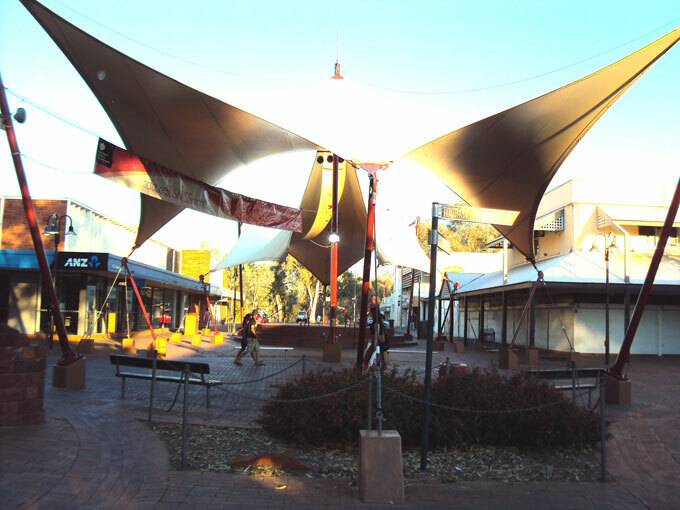 If some of the commercial businesses are reluctant to re-engage with the street and the community does not express its opinion strongly enough on the question of one or two way traffic (or any traffic), then I feel Alice Springs will end up with two way traffic in the mall as is currently being proposed. There is a good pedestrian / bicycle track running along the west side of the Stuart Highway between Larapinta Dr and Wills Tce. There is another one mirroring it running along the Todd River. Does the Alice Springs Revitalisation Project have any plans to connect the two with a pedestrian / bicycle track running east / west through the new CAD? A number of comments have been heard recently highlighting the misunderstanding and simmering animosity now existing between motorists and bicycles. This often comes bubbling to the surface at our roundabouts, of which the CAD has so many. One way around this accident that seems to be waiting to happen might be a designated east / west bike track.